Don’t worry, these mini muffins are so easy. The frosting is icing on the cake, literally! These have been kid tested and are mother approved! These are a spin on a southern classic. Growing up the in Georgia, I have eaten tons of zucchini bread. How can something that has a green vegetable in it taste so good?!? My dad always planted a garden and we always had lots of zucchini and pecans and what better way to put the two together! I suppose you could make this recipe in a normal muffin pan or in a loaf pan but I like using the mini muffin pans because of the small size for the kiddos and the more surface area gives the mini-muffins a nice crunchy outside. If your kids don’t like veggies, just don’t tell them the secret ingredient and they will never know! Invest in a mini-muffin pan and small scoop. Great tools to have in your kitchen that just makes your life easier, at least your time in the kitchen! These are great right out of the oven served with the the cheesecake frosting. These are great anytime of the day and would make a great snack, breakfast or dessert. You don’t have to make the frosting if you are looking to simplify the recipe but definitely try to serve them warm. If you don’t eat them right out of the oven, 8-10 seconds in the microwave will do the trick. If you don’t have coconut flour, you can add an extra 3/4 cup of almond flour instead. Coconut flour soaks up a lot of moisture and this is why you only need a fraction of the amount. Invest in a bag of coconut flour and it will last you a while and it assist in the yummy texture. 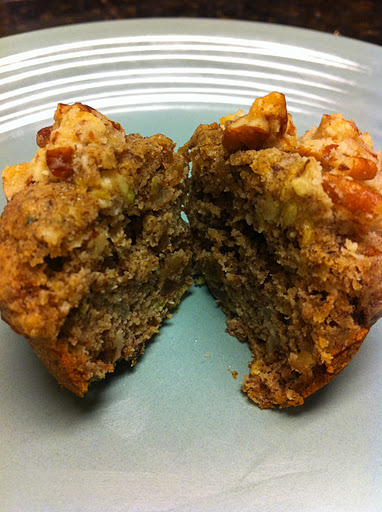 You can also substitute another nut such as walnuts instead of pecans! Mix all ingredients in small bowl. You can just spread over warm muffins or you can place frosting into pastry bag (or Ziplock) and pike onto muffins in whatever design you want. Mix together all dry ingredients. Then mix in zucchini , coating it in the flour mixture. In separate bowl, beat eggs well, then stir in sour cream, vanilla and melted butter. Add liquid ingredients to dry. Stir until moist. Oil or spray your mini muffin tin well. 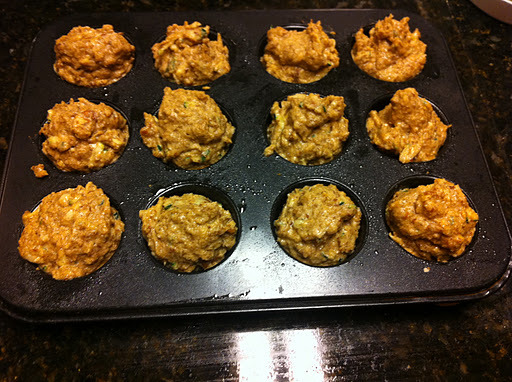 Use small heaping scoop (or heaping 1 tablespoon) into each mini muffin tin. Bake at 350 degrees for 15-20 minutes. Makes about 24 mini muffins. Before streusel was added and before going into oven. 1 muffin without frosting has about 1.5 carbs. 1 muffin with frosting, still less than 2 carbs. « 5-minute Ice Cream… No machine needed! Awe bummer– I just ate my last 2 zucchinis! Maybe I'll try with carrots? You seem to cook like me– 2 adults and 2 kids… We like easy, variety, and not 'missing our favorites'. You'll just have to get more zucchini but I bet it would be great with carrots! Yes, easy is always good and the occasional more complex recipe so that I can eat my favorites and not have to worry about it going to the belly! It is always worth the time and effort! Let me know if you try the recipe with carrots! This recipe looks awesome and I can't wait to try it, but I have a question: what do you do with the streusel? Do you mix it in with the muffin batter or do you put it on top? 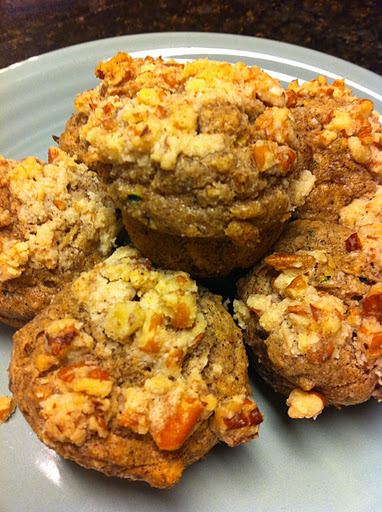 Lynn, you put the streusel on top of the muffins before putting in oven. Sorry, I need to clarify directions! Hope you like them! Is it possible to switch out zucchini for pumpkin puree? 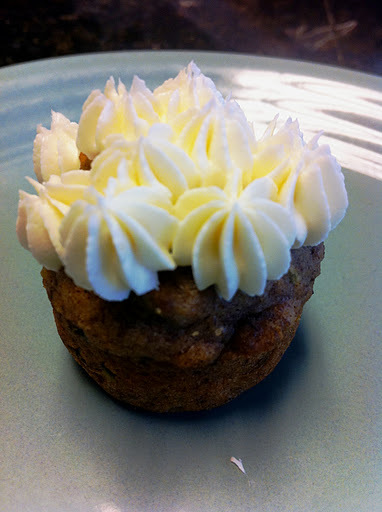 Or is it possible to put the pumpkin roll ingredients in a muffin mold instead of making a cake? Julie, I would think you can use the pumpkin roll in a muffin tin. I also have a Pumpkin Bread recipe in one of my cookbooks.